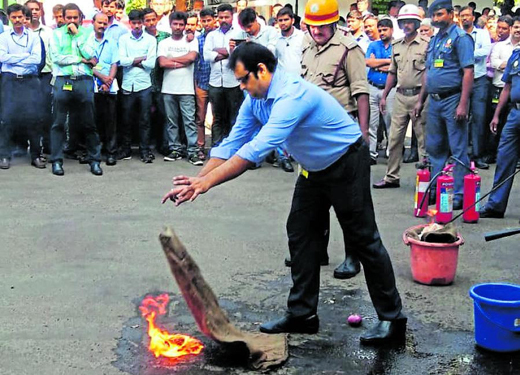 Mangaluru, Mar 20, 2019: Corporation Bank, guided by the Karnataka State Fire and Emergency Services Department, organised a mock fire drill at the Bank’s Corporate Office in Mangaluru. G Thippeswamy, Regional Fire Officer, Mohammed Zulfikar Nawaz, District Fire Officer, Kadri and B Shekar, District Fire Officer, Pandeshwar were the conducting Officers. P V Bharati, Managing Director and CEO, Corporation Bank, Gopal Murli Bhagat and Birupaksha Mishra, Executive Directors, Corporation Bank and 461 staff members participated in the fire drill. The fire drill was held with an aim to create awareness, to put system and procedures to test and ascertain the functional state of the fire safety equipment. As a part of fire safety measures, firefighting teams were formed for each floor of the administrative buildings in Corporation Bank, Head Office, to ensure safety. Team members will be imparted training in Basic Fire Safety & Emergency preparedness at periodic intervals. A group of fire-fighters headed by G Thippeswamy, armed with necessary paraphernalia required for fire-fighting and rescue operations, positioned themselves at vantage points to guide and assist staff members in the fire and evacuation drill. A demonstration of the use of fire extinguishers was conducted by the personnel of the Fire department. Bank staff practised the operation of different types of fire extinguishers. It is extremely important to us to have awareness program regarding fire safety measures in corporate office.